Eye For Beauty: Miss USA, Miss Universe Pageants to make Las Vegas long-term home? Miss USA, Miss Universe Pageants to make Las Vegas long-term home? Serious conversations are underway for the Miss USA and Miss Universe pageants to have a permanent home in Las Vegas, I can reliably and exclusively report. This Sunday, the 2016 Miss USA Pageant airs on Fox as a three-hour telecast from Las Vegas after a two-year absence when it was based in Baton Rouge, La., after a run here at Planet Hollywood from 2008 to 2013. This year, the glamour girls are headquartered at MGM Grand and T-Mobile Arena. Here is Richard Corey’s YouTube video of this year’s contestants arriving at MGM Grand. “Right now, we’re here for this show. But we definitely are looking at and we have started to talk about a long-term residency in Las Vegas for our pageants: Miss USA and Miss Universe. “Look around — why wouldn’t I be back here? This is Las Vegas. Las Vegas is our second home. We’ve always put on amazing shows here. Our new owners, William Morris Endeavor International Management Group, love Las Vegas because it’s exciting — it’s great. Both pageants were previously owned by Donald Trump, who sold them at the start of his presidential run. “I was only in T-Mobile Arena when they were building it, and it is a huge venue,” Paula continued. “I think you’ll see it’ll be pretty full on camera. The interesting thing is we needed more backstage room. We’re going to have 52 blow dryers going on at the same time. It’ll look good on camera. “This will be a bigger show than Baton Rouge, and we have some great talent. The fact that The Backstreet Boys are kicking off their summer tour with this show brings a lot of excitement to it, and also with Chris Young. 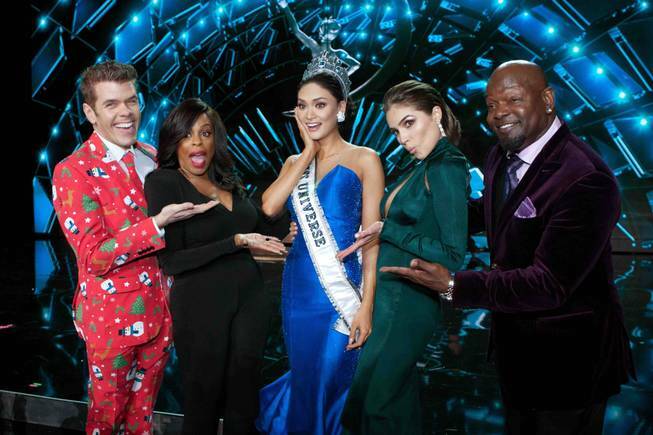 Steve Harvey, who was involved in the Miss Universe blunder in December naming Miss Colombia Ariadna Gutierrez the winner when it should have been Pia Alonzo Wurtzbach of the Philippines, returns to host Miss Universe in December. His co-host will be named soon. Body activist Ashley Graham will be on duty as backstage host as finalists prepare for their moment under the stage spotlights.